Three local shops on the different ways to approach selling vinyl. Photo by Brianna from the Torontoist Flickr Pool. This past Saturday, vinyl-heads around the world could be found sifting through bins of discounted records for Record Store Day 2016. Toronto’s record stores celebrated the annual event with a combination of in-store sales and performances. In a year that saw a 22-year high in the sale of vinyl records (that’s a total revenue of $222 million, for those keeping track at home), it’s worth taking stock of what it means to be a contemporary vinyl retailer. With brick-and-mortar storefronts no longer the only—or easiest—place to pick up the latest release or reissue, Toronto’s vinyl stores have to provide a myriad of services to consistently draw in customers. Some, like Sonic Boom, fill their store with artist merchandise and turntables; others make themselves available as a venue for local artists. Some stand behind the sale of vinyl and vinyl alone, their employees’ extensive knowledge the main attraction for experienced collectors. Yet, though they differ in selection and philosophy, many Toronto record stores share a collective identity: supporters and members of the city’s music scene. Relatively new to the scene is Little Italy’s June Records. The shop, run by former Kops Records manager Ian Cheung and his partner Dennis Reynolds, boasts a selection of new and used records and isn’t one to shy away from an in-house performance. “We cater to a lot of different kinds of record-buyers here,” says Patrick Grant, one of the store’s managers. “Our niche fits in a weird spot. A lot of it is based on attention to detail and catering across the board to people who are just deep music lovers.” The store seeks to accommodate both veterans and the newly initiated—as Grant puts it, they make a point of carrying everything from the latest Taylor Swift to a recent reissue of Fingers Inc.
He’s currently putting together an in-store performance for the upcoming Taste of Little Italy. Shows typically feature local artists or “friends of the shop in some way.” “I’d say everybody who works here plays music or is involved in DJing or putting out records,” he explains. “‘Friends of the shop’ is pretty loose because it’s just labels that we support and that are also local businesses.” Labels like Pleasence, Buzz Records, and Interactive Discs are all part of the community June Records finds itself in, and one it works to support. Grant plays local band Bart in the background as he talks—one of the band’s members works at the store. “It makes sense that people in the scene gravitate toward being in the shop,” he says. “People who devote all of their spare time to music are just naturally going to be pretty good at knowing what’s going on and staying on top of new stuff because they would be furthering that knowledge for themselves anyway. Based on our staff, we have good coverage of a lot of different stuff, so we can have really good scope.” Grant handles ordering for the business’s online store—no small task in itself. But it’s clear that when it comes to the success of June Records, the staff’s involvement in the music scene goes a long way. 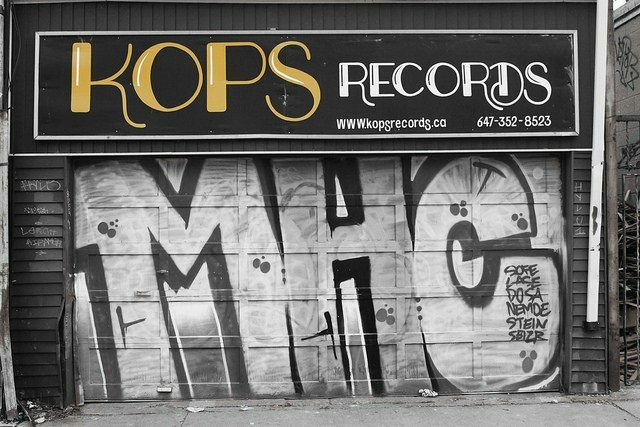 At 38 years old, Kops is one of Toronto’s longest-standing record stores. While stores like Sam the Record Man and A&A Records were closing their doors, Kops stuck it out and has now expanded to three locations. 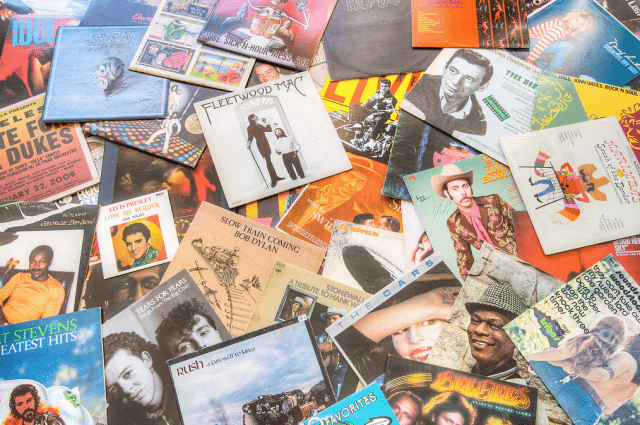 It’s known for its extensive ’45 collection—“probably the largest catalogued [collection] in the world,” according to Edwards—and for its extensively catalogued collection of vintage records. Chris says the Queen West location gets all sorts of customers, from dedicated regulars to students and tourists. Photo by Greg from the Torontoist Flickr Pool. The people who work at Kops know the Toronto music scene because they’re a part of it. “A lot of people play music here. A lot of people are involved in bands. We’ve got people from the States who are working here who are also involved in music,” Edwards says. This past year, the store’s Bloor location hosted local band Teen Anger, as well as a performance by the Cancer Bats. Edwards lists Arts & Crafts, Dine Alone, and Paper Bag as local labels the store orders from. “We’re definitely into helping out community in terms of local bands. We do consignment where we don’t really take any profit, we just market bands as local bands. We have in-store shows at the Bloor store. We try to promote local shows with poster boards—all that kind of stuff,” he says. Not every store is part of the in-store show movement, however. In fact, some don’t deal in new records at all. “We don’t do any sort of new releases or what’s hot for Record Store Day,” says Aki Abe, owner of 18-year-old Cosmos and Cosmos West Records, two storefronts that deal only in vintage vinyl. “We took a big chance, because everyone was doing CDs and everybody said, ‘You’re crazy, because vinyl’s out of fashion and it’s going to be obsolete in probably a few years, and you’re going to be going out of business,’ but we just like vinyl. So we stuck with it, and here we are,” he explains. 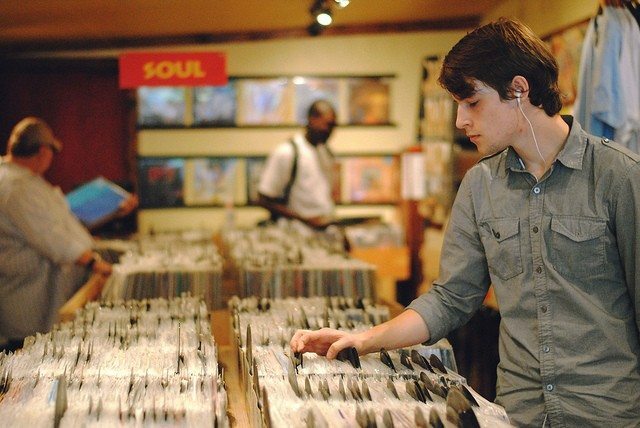 When asked about the stores’ demographic, Abe says that the stores “cater to the vinyl-loving community,” with one location dedicated to soul, funk, disco, classic rock, and early hip hop—“because we don’t like any of the new hip hop”—and the other to jazz, Latin, Brazilian, and psychedelic rock. Both storefronts are small, quiet, and intimate, a drastically different feel from larger retailers, or the Urban Outfitters location down the street. Photo by Shane Fester from the Torontoist Flickr Pool. That’s not to suggest the store doesn’t back local artists, though. “Of course we do,” says Abe indignantly. “We know all the artists down in the city, but we never do in-store, we never do live.” He lists underground hip-hop artists like Toronto’s Da Grassroots as an example. And as for not hiring DJs? “The guys that work for us, they end up being DJs,” he admits. Abe says that working at the store makes them better selectors and better DJs. While the store has a different way of operating than June or Kops, it still finds a way to fit into the city’s music scene. No matter the approach, all three locations have seen and reaped the benefits of the current vinyl boom. “Generally, you’re seeing labels print more and making more available, which wasn’t always the case,” says Edwards. “That leaves you open to different customer bases. People are constantly coming in asking about vinyl: how they can get started and what they can do in terms of turntables, stereos, that kind of stuff.” So at the end of the day? “It’s just a really good time to get interested in vinyl,” he says.